UNITED NATIONS -- The U.N Security Council unanimously adopted a resolution on Friday calling for an end to the month-old war between Israel and Hizbollah, but the Jewish state said its offensive in Lebanon would not be halted yet. The vote in New York capped weeks of anguished negotiations on a plan to halt the war, triggered on July 12 when Hizbollah guerrillas captured two Israeli soldiers in a cross-border raid. The resolution, negotiated by the United States and France, authorised up to 15,000 U.N. troops to be deployed to monitor a withdrawal of Israeli troops from southern Lebanon and to help the Lebanese army enforce a ceasefire. The Lebanese government accepted the resolution and would issue a formal acceptance to the 15-nation Security Council on Saturday, an official source said. Israeli Prime Minister Ehud Olmert told U.S. President George W. Bush he backed the resolution, an Israeli government official said. "The prime minister spoke with President Bush and thanked him for his assistance in keeping Israeli interests in mind at the Security Council," the official said. Olmert will urge his cabinet to approve the U.N. resolution at a meeting on Sunday. An Israeli official said before the vote, however, the Israeli army would not stop its offensive in Lebanon until the cabinet met on Sunday to consider the resolution. Earlier, Olmert ordered an expansion in the ground offensive against Hizbollah, which has strongholds in southern Lebanon. Israeli attacks killed 26 people in Lebanon on Friday, seven of them when a drone fired rockets at a convoy of hundreds of cars fleeing the south. An Israeli soldier was killed in fighting and Hizbollah rockets wounded seven people in Israel. At least 1,041 people in Lebanon and 124 Israelis have been killed in the month-old war. 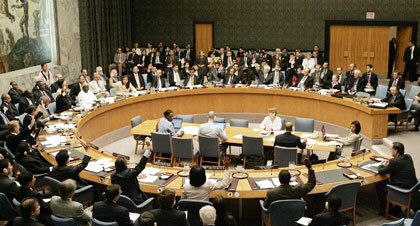 The U.N. resolution called for a "full cessation of hostilities". Hizbollah should stop all attacks immediately and Israel should end "all offensive operations", it said. After fighting stops, Israel must withdraw all its forces from southern Lebanon at the earliest opportunity, said the resolution. Lebanon is due to deploy its armed forces throughout southern Lebanon as Israel withdraws. U.N. Secretary-General Kofi Annan said he would help the parties over the weekend to establish a timetable for a truce. He chastised the Security Council for not acting sooner when civilians on both sides "have suffered such terrible, unnecessary pain and loss". "All members of this council must be aware that this inability to act sooner has badly shaken the world's faith in its authority and integrity," Annan said in an address. "War is not politics by other means." U.S. Secretary of State Condoleezza Rice cautioned no one could expect the resolution to end all violence, saying: "The conditions of a lasting peace must be nurtured over time." British Prime Minister Tony Blair welcomed the resolution and said he planned to visit the Middle East soon to search for ways to bring peace between Israelis and Palestinians. "We must work to address the underlying root causes of this conflict," Blair said in a statement. "We must never lose sight of the fact that the conflict in Lebanon arose out of the desire to exploit the continuing impasse in Palestine." At the insistence of Lebanon, a reference was dropped from the resolution's final text to Chapter 7 of the U.N. Charter that permits a robust U.N. peacekeeping operation. But the text still carried strong rules of engagement for the U.N. force that France was expected to lead. Israeli raids on a bridge near the border with Syria killed 12 people and wounded 18, hospital staff said. Witnesses said a second strike hit the bridge 15 minutes after the first had brought rescuers rushing to the scene. Israeli bombs also hit electricity transformers and cut off power to the southern city of Tyre, security sources said. Hizbollah announced the death of four more of its fighters. More bombs hit Beirut's battered Shi'ite Muslim suburbs, hours after dawn raids on the capital. Many people fled the suburbs on Thursday after Israel dropped warning leaflets. Hizbollah fired more than 55 rockets into Israel, wounding seven people, Israeli police and ambulance staff said. Humanitarian agencies sought ways to get aid to an estimated 100,000 people trapped in southern Lebanon and the mayor of Tyre said the city could run out of food in two days. Aid convoys have been unable to deliver supplies since an Israeli air strike hit a bridge on the Litani River on Monday. · Terror plot probe under way in U.S.